Original jazz compositions featuring guitar and acoustic bass. 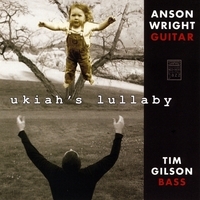 "More so than any other type of ensemble a duet is about chemistry, communication and nuances, Anson Wright and Tim Gilson create a fabric of beauty, vivid colorations and intimate, intuitive offerings through each composition on Ukiah’s Lullaby...Wright’s ability to balance technical prowess with beauty is truly the pearl within this timeless recording." moved by the overall conception, and by the artistry, intensity, and restraint..."
Director, Lake George Jazz Festival, and author of The Tin Angel. "Both guys have to be at the top of their game, because there’s no place to hide. On these ten recital-quality studies of two cats deep in the shed, it all works to perfection." Master guitarist, composer, writer, and educator Anson Wright spent his formative twenties in New York City. A graduate of Princeton, Anson left post-graduate studies at Columbia to pursue his creative visions far from cloistered academia. Living in the East Village and frequenting performances by Charles Mingus at the Five Spot, Anson composed and performed music for finger-style guitar as well as immersing himself in the vibrant literary and alternative education scenes. In addition to pursuing his musical career, Anson completed his novel, Jericho, drove taxi, taught guitar and creative writing, ran a trucking company, and built cabinets. Anson’s early jazz studies began in clinics with the legendary jazz guitarist Howard Roberts. Later teachers on the West Coast included John Stowell and Jerry Hahn, as well as veteran pianist Harry Gillgam. Anson has performed throughout the United States and has worked with numerous jazz luminaries, including Grammy nominated vocalist Nancy King and bassist Glen Moore. With a style often compared to Jim Hall’s, his playing has been lauded as “elegant” and “impressive,” demonstrating what one reviewer calls a “finely honed harmonic intelligence.” Anson’s original guitar compositions have been choreographed and performed in modern dance, and his poetry has been set to modern dance and to music, He has taught at numerous schools, including New York University, Pacific University, and Portland Community College. Anson is an endorsing artist for Hofner guitars. In addition to his CD releases, State of Grace and Ukiah’s Lullaby, Anson is the author of three books. He is one of the small number of jazz artists who have received critical acclaim as writers as well as musicians. Author Anais Nin praised the writing in his novel, Jericho, calling it “bottom of the sea level”. The National Endowment for the Arts provided the funding for his second book, Openings. Anson’s first full-length poetry book, Sandstone Monastery, was released in 2004. Poems from Sandstone Monastery were set to music in the 2008 CD, The Sky At Our Feet.